The Montes de Malaga Natural Park, covers 47sq Km of mountains ranging from 80m to just over 1000m above sea level, which are situated 14 kms to the north of Malaga, adjacent to the north side of the city, with the main entrance at Fuente de a Reina. Deep gorges were formed by torrrents of water and sheer drops. Aleppo pine trees were planted in the Rio Guadalmedina basin, which flows to the west of the park, by Malaga City Council in a reforestation campaign from 1930 until 1950 to prevent flash floods that had caused problems for centuries. 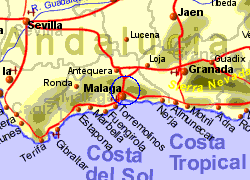 Deforestation began of the original mediterranean woodland in the 15th century when the land was divided up by the Catholic Monarchs who took possession of Malaga. Other trees such as scarlet oak, carob and olive were also planted in the area. An abundance of wildlife can be seen in the park including foxes, sparrows, badgers, weasels, eagles and hawks. The area is also well known for its restaurants serving cured meats and local wines. 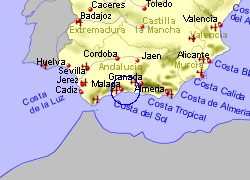 Map of the Montes de Malaga Natural Park area.